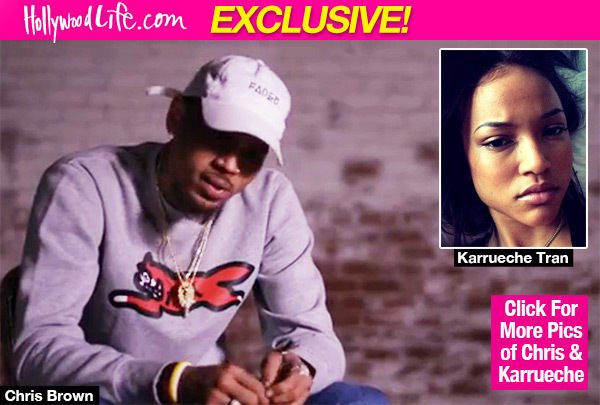 A lot of fans may be excited to watch Chris Brown’s upcoming documentary, but Karrueche Tran isn’t excited about it. HollywoodLife.com has EXCLUSIVELY learned she believes he’s just ‘trying to make people feel sorry for him, and she wants nothing to do with his ‘pity petty’ film. Chris Brown released a trailer on his up coming documentary, Welcome To My Life which could very easily make even his biggest hater fans fall in love with him. But Chris’ ex, Karrueche Tran, won’t be manipulated by “his lies.” She believes that he is just releasing this documentary so “people feel sorry for him,” but it won’t work on her. He’s done too much damage to her for her to even give him another chance. “Karrueche won’t be watching Chris documentary because she’s not about to sit there and listen to his lies and take part in his pity party. She’s so done with Chris and his crap, and him trying to make people feel sorry for him. Talk about the worse day of someone’s life. Finding out, online none the less, that the man you’re with and love cheated on you and had a baby with that person! Yeah, that was a pretty rough day for Karrueche. She wishes Chris well, but at the same time, she believes he’s a joke and full of games and a cheater who hasn’t learned squat,” a source tells HollywoodLife.com EXCLUSIVELY. As HollywoodLife.com previously reported, Chris will be talking about a lot of things in his upcoming documentary, including his 2009 assault the singer Rihanna. In the trailer, Chris says he went from being “on top of the world,” while being in a relationship with a woman he was in loved with, to being one of the most hateful men in America. We can only imagine Chris will also be talk about his daughter, Royalty, and why his relationship with Karrueche ended so fast. It may be cathartic for him, but Karrueche won’t be watching.